The Charleston community continues to move forward with resounding unity by creating a collaborative mural that will recognize the past and welcome a bright future. A three-day event called Paint Strong for Charleston Strong will begin on Wednesday, Oct. 21, during which the community is invited to help paint hundreds of doves that will be part of a mural on one of the college’s walls located near the corner of Rutledge Ave. and Grove St. Led by Citadel cadets − school children, neighbors and people from across the community will use stencils to paint doves that will surround a rendition of Gil Shuler’s Nine Doves image, and the words “Charleston Strong.” Shuler’s design has become a widely used symbol of healing for the city in the wake of the Emanuel AME church shootings in June during which nine people were killed, including Citadel Graduate College alumna, Mrs. Myra Thomson. At 10:30 a.m. that Wednesday, the project will be kicked off by the release of nine live doves and Charleston Mayor Joseph P. Riley and stateSenator Marlon Kimpson, painting the first dove on the wall together. (Riley graduated from The Citadel in 1969, and will join the college after retiring from public office in 2016 as the first occupant of the Joseph P. Riley Chair.) The painting of the mural will continue until 3:30 p.m. that day, then resume Friday from 9 a.m. – noon, and again on Sunday from 1 – 4 p.m. Participation is free, no experience is necessary and all ages are welcome. Supplies will be provided. “In the past six months, Charleston has undergone a great deal of stress and sadness. 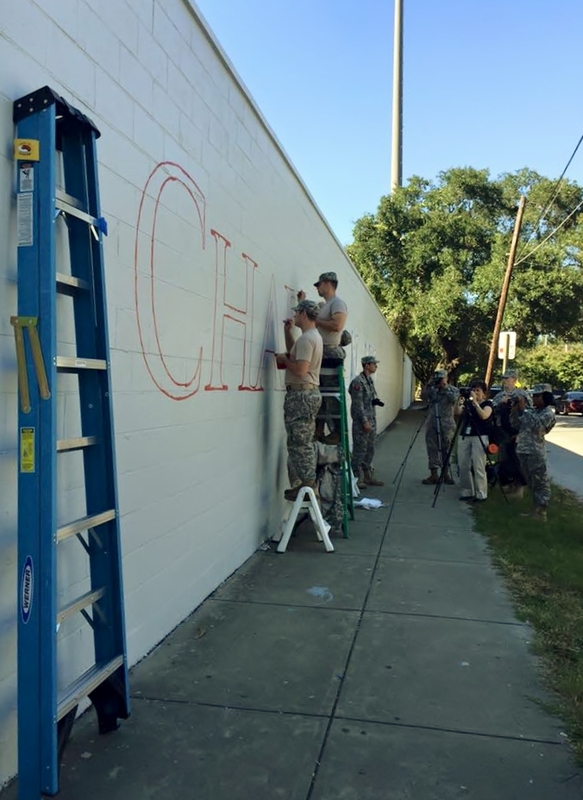 The Charleston Strong mural is a way to extend the bond we share as Citadel cadets to Mother Emanuel and the whole Charleston family,” said senior Cadet Thomas Scerbo, vice president of the Fine Arts Club, and a fine arts minor. To prepare for the Charleston Strong mural, the twelve foot high, 293 foot long wall lining the college’s former baseball field along Rutledge Ave., was repaired and given a double basecoat of paint. The first elements of the mural were painted by cadets who attend fine arts classes at the college, to enable members of the community to paint their doves around it. “The Nine Doves image is over ten feet tall and dark Citadel blue with the words "Charleston Strong" painted next to it in red,” said Tiffany Silverman, director of The Citadel Fine Arts Program. Silverman created the mural concept, then engaged the college’s Krause Center for Leadership and Ethics to help move it forward. “Doves are not only a sign of peace but also a symbol of hope. We hope that the mural will be a powerful, visual reminder that the spirit of Charleston Strong will continue no matter what challenges lie ahead,” Silverman said. Paint Strong for Charleston Strong is part of The Citadel’s Leadership Day 2015, during which 1,200 cadets will fan out across the Lowcountry providing volunteer service to dozens of schools and more than 30 community agencies. The mural is a collaborative effort headed by Citadel Fine Arts Director, Tiffany Silverman, and the Krause Center for Leadership and Ethics, with the support of Lowe’s, Valspar, The Color Chemists, The Citadel Fine Arts Department, Gil Shuler Graphic Design, Inc., the Carnegie Foundation, The Citadel’s Krause Center for Leadership and Ethics. For more information about the mural, please visit www.citadel.edu/finearts. For more information about Leadership Day 2015, please click here.